February 6, 2015 February 13, 2015 by Beau H.
Although I’m based in Brooklyn now (along with my amazing girlfriend Liz), my roots are in mid-Michigan. I grew up twenty minutes from Michigan State University, wrote and edited news and sports for three years at The State News and absolutely consider myself a Spartan at heart — sorry to disappoint any Wolverine fans reading the blog (see you in October, yes?). So all of that makes this weekend pretty special — I’m flying back into Lansing, Mich., on Friday and taking the short drive down the road to reconnect with great friends from both high school and college. 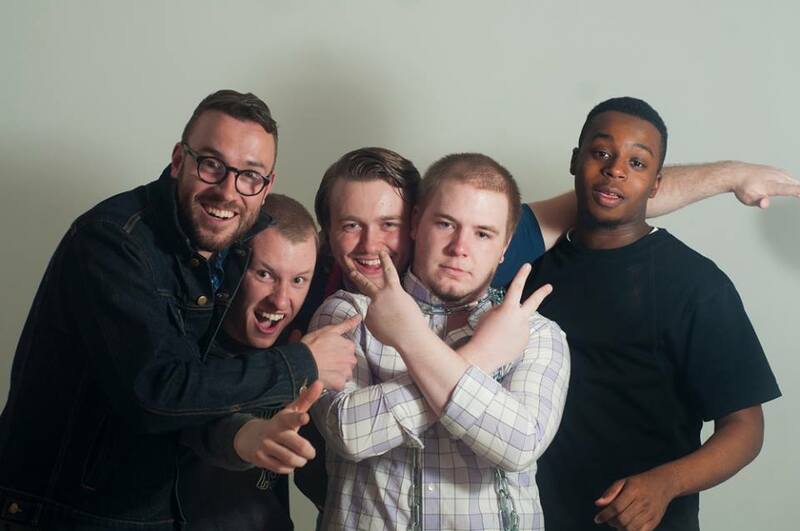 A picture from my stint as sports editor at The State News, circa spring 2014 (I’m on the far left). It’s an exciting trip, one that I’ve been looking forward to for a while. With that being said, I’m still aiming to get around in style. It should be a pretty chilly weekend back in the Mitten (unlike a trip this past summer to San Francisco), so I’m aiming to to be warm and still look good. Of course, I’ll be bringing all my gear in my trusty Navali Stowaway Weekender and a well-worn Kenneth Cole Reaction messenger bag. Check out the photos and line-up below to see what’s trip-worthy. Most of what’s going in the bag this weekend. Sweaters and shirts top left, bags top right. Jeans, shoes and socks bottom left. Dopp kit and other accessories on the bottom right. Not pictured: Overcoat, scarf and gloves. At first glance, that might seem like a lot of clothes for one weekend. However, each piece has its purpose in combatting the cold Michigan weather. I plan to wear the crewneck sweatshirt, blue OCBD, Bonobos Travel Jeans and wingtip boots on the plane, layered under my charcoal overcoat. That same combination should feasibly work on Friday out and about in East Lansing, although based on conditions on the ground there, I might switch over to my leather sneakers for more casual wear. A close-up look at some personal favorites. Pictured: Billy Reid x K-Swiss sneakers, GAP chambray and Bonobos Travel Jeans in Allegheny Oak. For the rest of the weekend, I plan to layer either the Reigning Champ crewneck or Todd Snyder cardigan (a recent purchase —check out another photo here) with my Everlane henley, the GAP chambray shirt or the charcoal pocket T-shirt. Any combination should work well given the weather and the relatively interchangeable colors of each piece. And since the trip should involve some visits to East Lansing’s finer establishments, either sweater should also look stylish but not too dressy. If the weather proves warmer than expected, any of the above shirts could be worn on their own, too. I’m definitely looking forward to wearing more casual outfits this weekend, as I tend to stay pretty dressed up during the week. On the accessories front, either casual belt should fit right in — since my sneakers are a rugged, worn-in brown leather and part of casual pairings, I’m not too concerned about matching with the casual black belt from Perry Ellis or my black rubber-strap watch. The key accessories for this trip. Pictured: J. 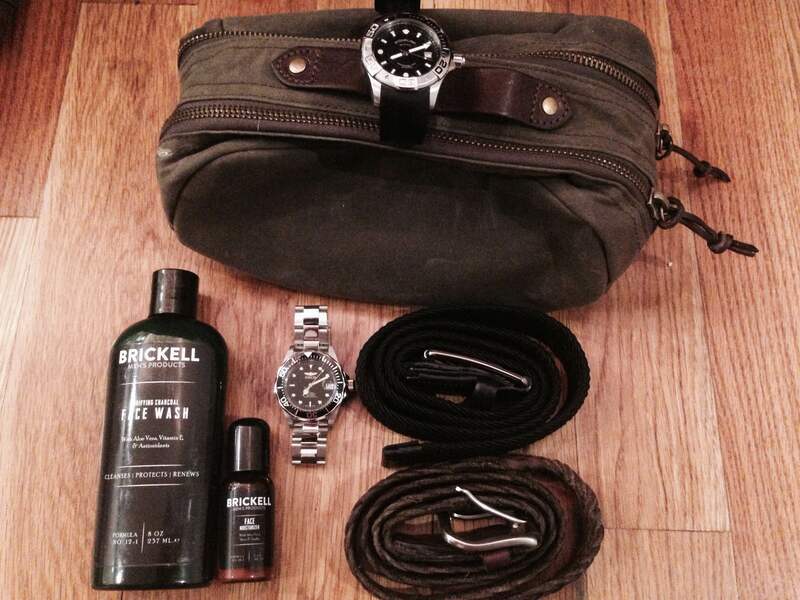 Crew Factory Dopp Kit, Perry Ellis Black Webbed Belt, Target Merona Braided Leather Belt and Invicta & Stuhrling watches, along with some recent pick-ups from Brickell Men’s Products. That brown leather belt from Target’s Merona line has proven to be durable and versatile as well, bringing the right amount of fall and winter texture to casual outfits. It can be worn with either set of shoes, too (on that note — if it proves extremely snowy, the sneakers might have to stay in the bag). With a lot of varying shades of blue in various outfits, darker navy or red socks should offer a nice contrast, while the grey patterned socks can be worn casually with any combination (because matching your socks to your pants is old-fashioned, right?). As to my accessories, I’m admittedly a watch guy — my collection recently grew to include a Form-Function-Form No. 8 Chromexcel Horween leather strap. However, for maximum versatility, I’ll be bringing my silver Invicta dive watch to pair with either belt or shoe combination (for more on the watch, see the above review). I’m also packing a black rubber-strap watch as a second, more casual option. Of course, no trip would be complete without a handy (and stylish) dopp kit, like the terrific olive waxed cotton option from J. Crew Factory pictured above. Mine will definitely include some skincare essentials I just picked up from Brickell Men’s Products. With all the above in mind, hopefully this bag is packed for maximum versatility and style. 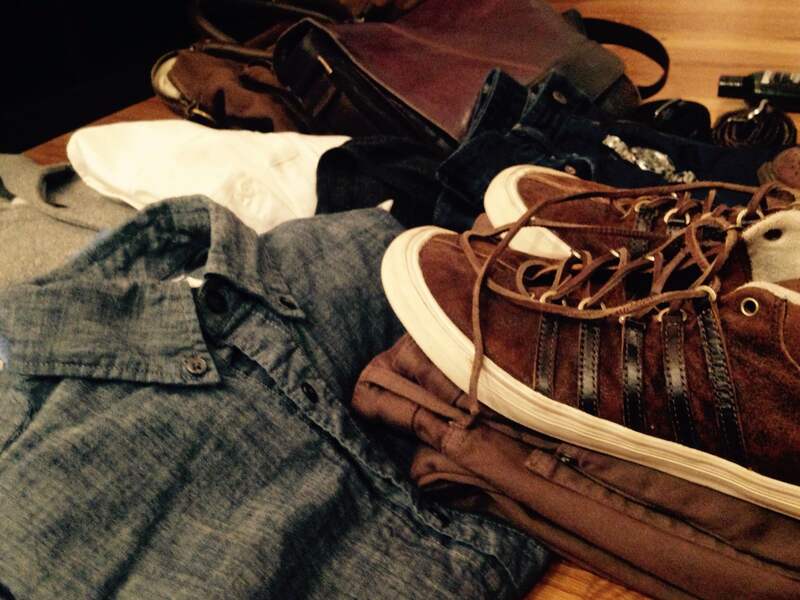 Next week, check back for a recap on the trip and this packing plan! 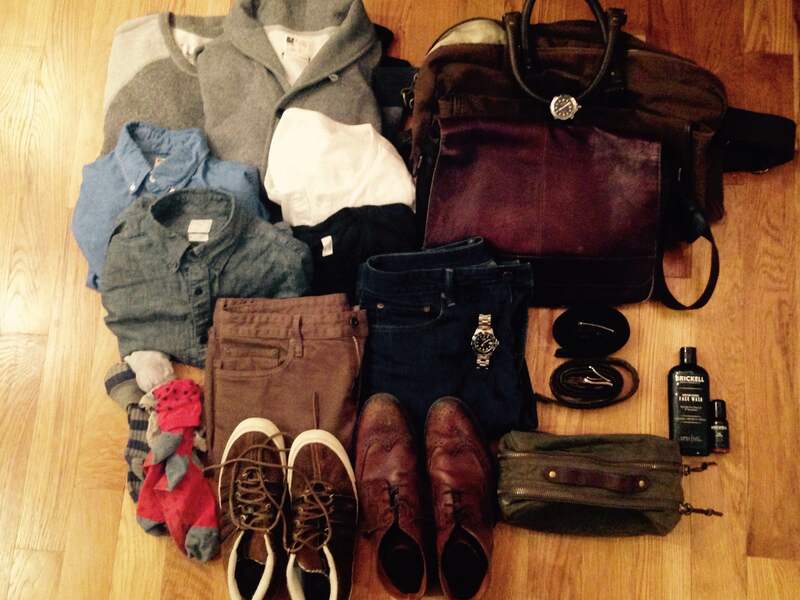 What’s in your bag when you hit the road? Any travel must-haves?